Our Workshop Yesterday....In A Word....MAGICAL! 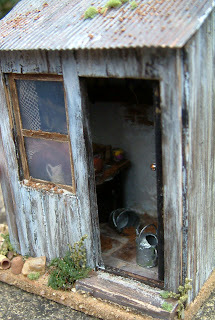 We had a truly magical day at our Little Old Garden Shed Workshop yesterday, held at Waterperry Gardens in Oxfordshire....a real day to remember. To see what we all got up to, do take a peek at the photos below. As you can see, some pretty amazing creations emerged by the end of the workshop.....thank you ladies for an absolutely brilliant day!!! 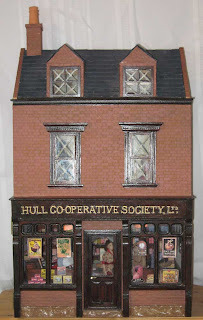 Followers of KT Miniatures Customer Gallery will have already seen the wonderful 1940s Co-operative with living quarters above, made by Linda Holmes from Dorset (UK) quite some time ago now. 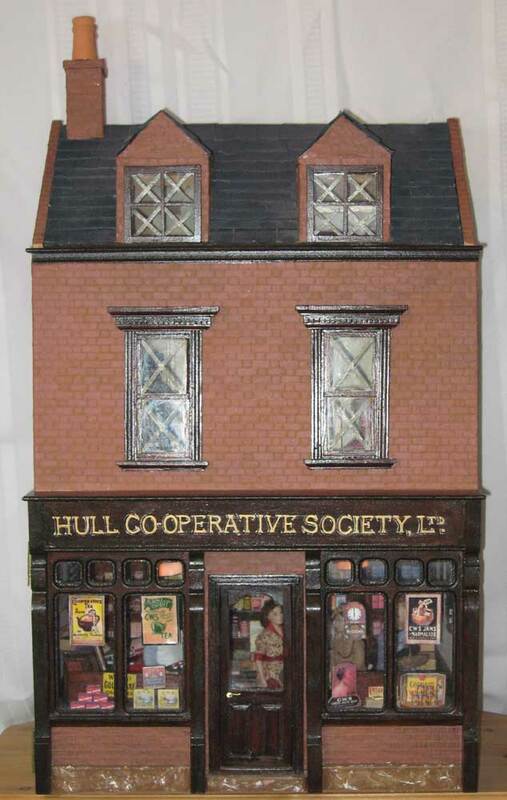 Her mum worked in the Hull Co-operative before and after the war, so was the inspiration behind this creation. 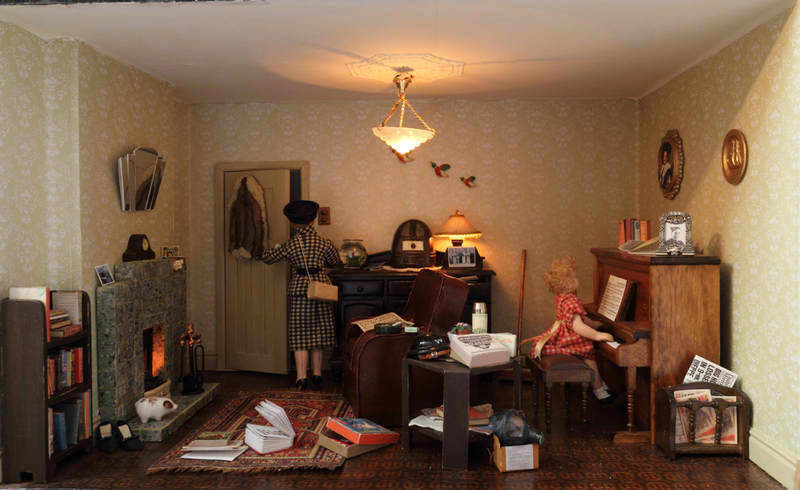 Linda has emailed me a wonderful updated photograph of her wartime living room above the shop with some new additions. I think you will agree that this is exquisite. Linda tells us...."The Lady leaving the room has a shorter skirt (rationing you know) and now has drawn on stocking seams (no silk stockings from a friendly yank for her), she has a small belt on the back of her jacket which makes it look a bit more dressy (she thinks). She has now remembered to take her gas mask with her too." Am Taking It Easy- But Now Open Once More. Many thanks for your private get well messages and cards.....you have no idea how they cheered me up. 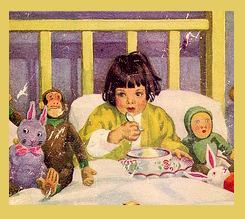 And although I may not be up to to running for the bus (or Olympics) or anything just yet..........KT Miniatures is back open for business!! I hope to catch up with the backlog of emails over the next couple of days. Thank you for your patience. Just to let you know that KT Miniatures is closed for a few days........yep yours truly is proper poorly. Will be back open for business again shortly. Unusual c1930s Coal Scuttle With George V Coin....Plus A Wobbly Elgin Table! Particularly weird and wonderfully whacky miniature things!! 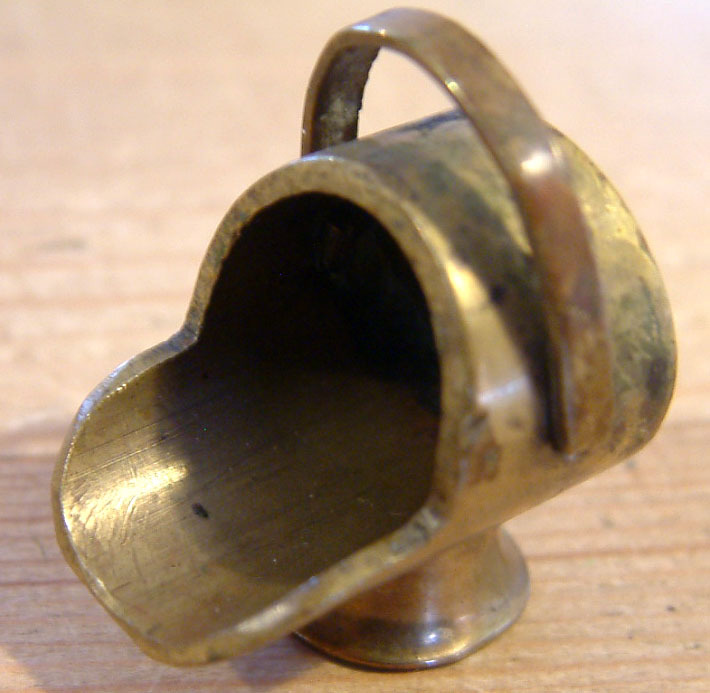 At first glance, this looks like a relatively ordinary brass coal scuttle.........turn it round then you see it is a bit unusual! 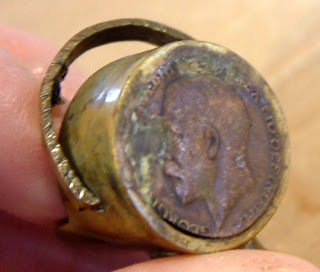 Yep, at one end a King George V coin, albeit a little on the tarnished side, has been incorporated. So, this is a bit more interesting than your common and garden coal scuttle and a bit more valuable too. It even has a movable handle........nice.....very nice! 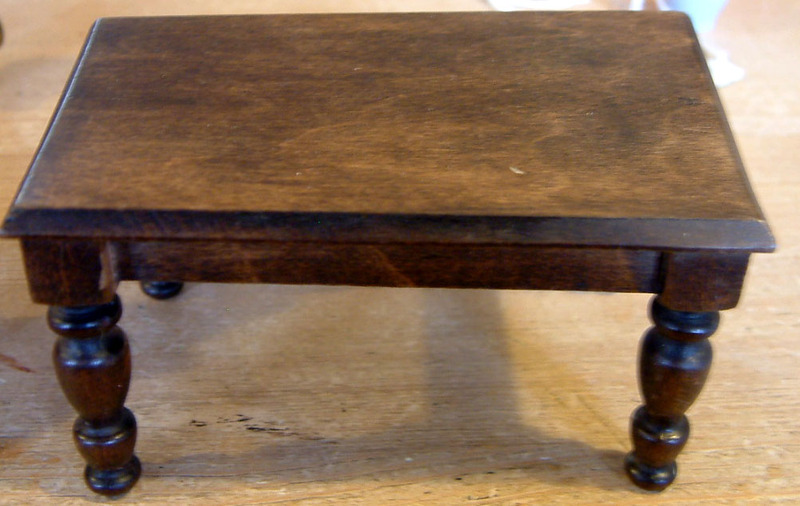 Then there is rather lovely unmarked c1920s Elgin table.....at first glance you think wow.....but on close inspection it is a bit different. 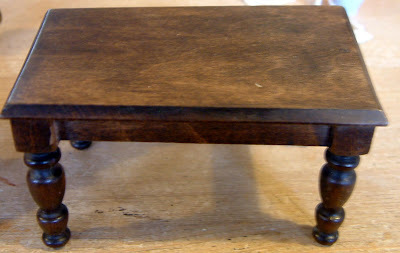 Yep folks....this is a beautiful Elgin table with a noticeable warp at one end. So......this is being offered at half the normal retail price....a bargain and an opportunity for someone to grab a piece of Elgin that just does not come along very often. 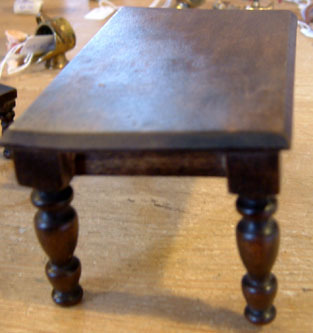 I personally would be tempted to shove a miniature book (or two) under the leg....wobble sorted! THE LITTLE GARDEN SHED WORKSHOP - WATERPERRY GARDENS...one space available! We have unexpectedly found ourselves with one spare place for our very first all day workshop at Waterperry Gardens in Oxfordshire on Sunday March 25th. This is the 1/24th scale version of the shed, in a white washed finish with black painted door. A choice of colour variations will be available on the day. 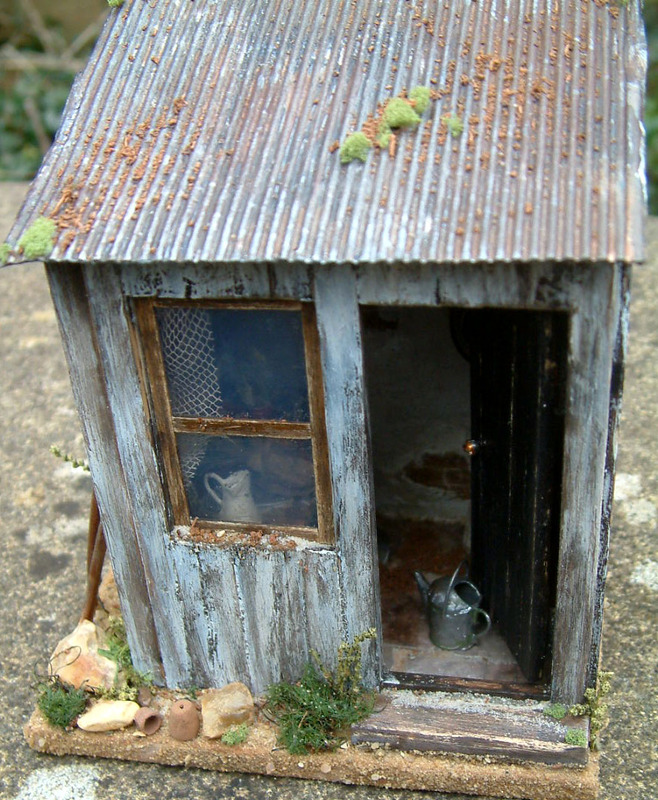 You have a choice of making a 1/12th scale weathered old shed or a 1/124th scale shed. 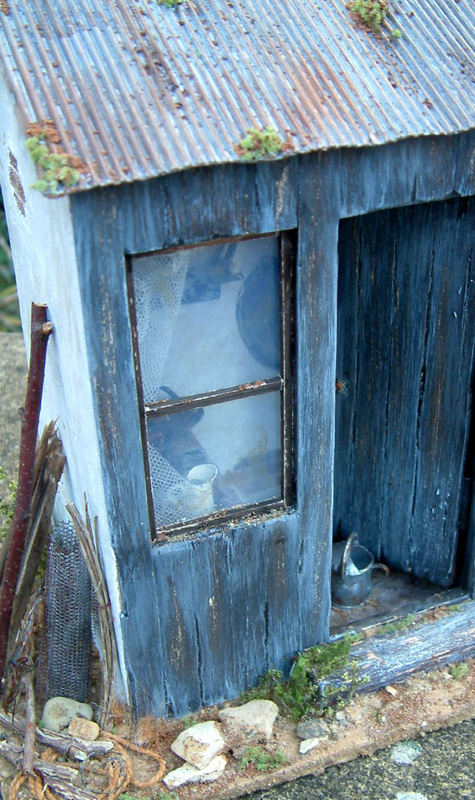 This is the 1/12th scale version in a weathered wooden finish. It should be a fun day in a magnificent Oxfordshire setting, with friendly people and a relaxed atmosphere. Suitable for beginners and experienced alike.